He lived during an age of great inventors like Henry Ford, George Westinghouse, Nikola Tesla, Alexander Graham Bell, Marie Curie, the Wright Brothers, Edwin Land, and Harvey Firestone. But it was Edison’s name that rose to the top. While he had many detractors, Edison’s name was revered by millions, creating generations of Edison wanna-bees. Businesses found this to be a threat to their influence and control and began forcing all new-hires to sign over the rights to their inventions during their time of employment. And so the great age of inventors came to an end… at least for a while. Some went so far as to describe Jobs as the “Father of the Digital Revolution.” However, when Jobs died, the world has once again been left with a huge void. Here’s a look at some of the contenders and why we’re in for some dramatic times ahead. On the other end of the spectrum, today’s Tony Stark computer genius-type inventor is never being more than 10 keystrokes away from whatever information is needed and able to compress eight years of product development into 5 minutes with the aid of a room-size interactive hologram and an ability to gesture-manipulate components on the fly. Economic Innovators – In the months following Bitcoin’s debut, a number of other crypto currencies began to surface, causing us to rethink our relationship with money. This is far from an exhaustive list of how and where innovation can take place, but a few to stimulate your thinking as to the toolsets true innovators will use to break down the barriers before them. A good sign that someone is vying to don the title of “World’s Chief Innovator” is his or her unquenchable thirst to create something new. Having one wildly successful business or product is never enough. Elon Musk – As one of the founding members of the infamous PayPal Mafia, Musk is the founder of the electric car company Tesla, space technology company SpaceX, and the attention-grabbing Hyperloop mass transit company. Jeff Bezos – Founder and CEO of Amazon.com, Bezos is one of the most successful entrepreneurs of our time, and the man who revolutionized e-commerce. In 2013, Bezos purchased The Washington Post newspaper. Larry Page – Co-founder and current CEO of Google, Page is leading one of the most innovative and successful companies in the world, perhaps in history. Sergey Brin – The multi-billionaire co-founder of Google, Brin has been involved with some of the company’s most innovative technologies including Google Glass, and Google’s self-driving cars. J. Craig Venter – Venter is an American biologist and entrepreneur. He is known for being one of the first to sequence the human genome and for creating the first cell with a synthetic genome. He is currently on a quest to develop synthetic antibodies and new forms of life. Mark Zuckerberg – As the youngest member of this elite list and founder of Facebook, Zuckerberg has been unusually skilled at treading the fickle waters of social networking. His age of innovation is only beginning. Bill Gates – As the founder of Microsoft and perennial winner of the richest guy in the world competition, Gates has become very focused on innovation through highly directed philanthropy. Pete Diamandis – Diamandis is an American engineer, physician, and Intel entrepreneur best known for being the founder and chairman of the X PRIZE Foundation, along with co-founder and chairman of Singularity University. Jack Ma – Former CEO of the amazingly successful Alibaba Group, Ma is currently focused on rethinking education and environmental issues in China. Sebastian Thrun – Thrun is an educator, programmer, robotics developer and computer scientist from Germany. Currently he is CEO and cofounder of Udacity, a disruptive force in higher education. Peter Thiel – Thiel is an American entrepreneur, venture capitalist, and hedge fund manager. Thiel cofounded PayPal with Reid Hoffman and Elon Musk, and served as its CEO. He also cofounded Palantir, of which he is currently chairman. Paul Allen – Allen is an American business magnate, investor and philanthropist, best known as the co-founder, with Bill Gates, of Microsoft Corporation. Reid Hoffman – Founder of the pioneering social networking website, LinkedIn. Hoffman is a Silicon Valley veteran who was also a member of the Paypal Mafia. Richard Branson – The colorful and creative British founder of Virgin Group is one of the most successful businessmen of our time, as well as a billionaire philanthropist and humanitarian. Ray Kurzweil – Revolutionary futurist, celebrated inventor, innovative researcher, and bestselling author, Kurzweil received the 1999 National Medal of Technology and Innovation, and is currently Director of Engineering at Google working in the field of artificial intelligence. Dean Kamen – An American inventor and entrepreneur, Kamen is perhaps best known for inventing the pioneering transportation vehicle, the Segway. Larry Ellison – Co-founder and CEO of Oracle, Ellison is one of the wealthiest individuals in the world and has been a long-time pioneer and innovator in the software industry. Hiroshi Mikitani – Mikitani is co-founder and CEO of Rakutan, Japan’s largest e-commerce company with a focus on empowering merchants with exceptional service. Jony Ive – A world-renowned product designer, Ive is the person responsible for many of the Apple’s most innovative and pioneering designs, including the iPhone, the iPad and the Macbook. Marissa Mayer – As the only female on the list, Mayer is the current CEO of Yahoo, first female engineer at Google, and at 33 was the youngest on Forbes list of the 50 Most Powerful Women in Business. Jack Dorsey – Jack is best known as a co-founder and co-creator of Twitter and as the founder and CEO of Square, a mobile payments company. There are perhaps dozens, even hundreds more that should be on this list. 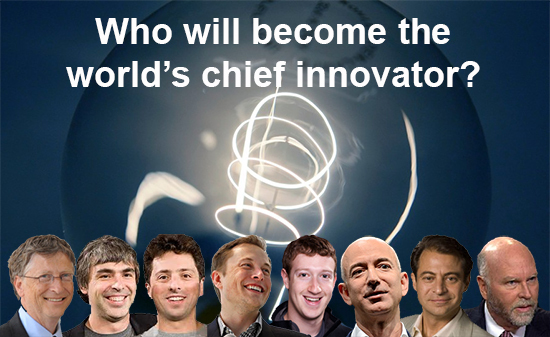 It could be that the most innovative of all hasn’t even revealed themselves yet. Many of our largest industries are still waiting for a disruptor to emerge. To be sure, we haven’t yet seen the chief reformers for the power industry, healthcare, space tourism, telecom, cable TV, banking, credit cards, and insurance. At the same time, the biggest innovations of all may actually take place with new forms of government, reinventing the tax code, or developing some new financial system. If Linus Torvalds grew up being trained as a mechanical engineer instead of a software engineer, would he have started an open source movement for robots? If Werner von Braun had known about the Space Elevator in the early 1900s, would we be using one today, or at least be a few years closer to reality? If Judge Harold Green hadn’t broken up AT&T, would we ever have gotten to the point of developing the Internet? Innovators come in many forms and have a way of being revered throughout history. While it requires an unusual personality and the path is strewn with hardship and confrontation, the world now views the innovator as the most honorable of all professions. There’s an opening. No need to apply, just do it!